Presents to our customers various bottom and valve solutions suitable for packing and use conditions. 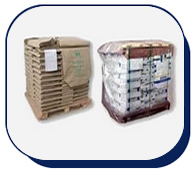 Sacks are shipped with various packagings according to buyers transport, storage and useage conditions and facilities. 1 - Pallets stacked manually or with stacking robot. 3 - Packaging as bale or sling. 3 - Bundles tied with plastic tape convenient to carry by human power.